Originally posted by Steve Sucato for Cultured.GR 3/6/17. Grand Rapids Ballet’s Creative Director, Michael Auer, creates theatrical magic behind the scenes. In preparation for this weekend’s “MOVEMEDIA: World Premieres” performances, the Ballet’s creative director can be found high above the stage hanging projectors—or whatever it takes to help choreographers and dancers realize their visions. Dancers at Grand Rapids Ballet (GRB) rehearse in preparation for “MOVEMEDIA: World Premieres” performances March 10–12. 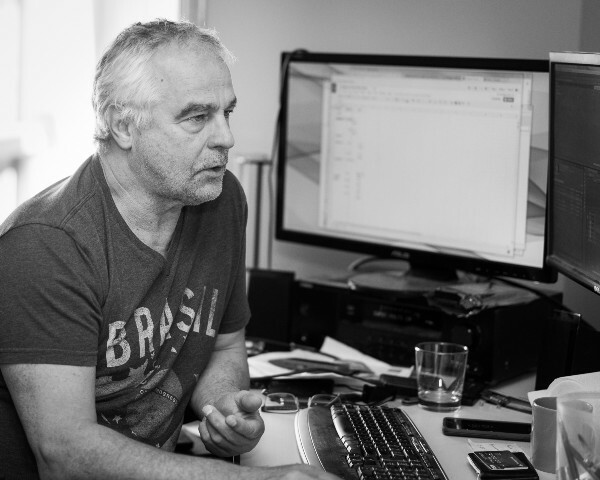 Photo credit Eric Bouwens. “Pay no attention to that man behind the curtain,” said the Wizard of Oz after being caught for the elaborate stagecraft he presented to Dorothy and her compatriots in the 1939 movie classic of the same name. 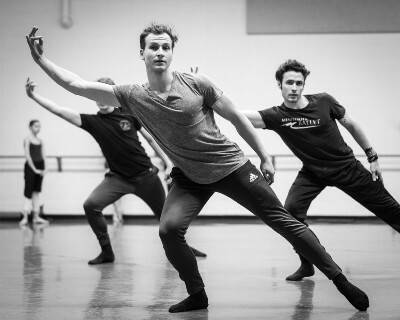 It’s a desire for anonymity Grand Rapids Ballet (GRB) creative director Michael Auer, the organization’s own multi talented and multifaceted wizard, can identify with as well. When it comes to helping others find the courage, heart and smarts in their creative endeavors for the 46-year-old ballet organization, Auer stays behind the scenes. Michael Auer, creative director at Grand Rapids Ballet. Photo credit Eric Bouwens. Born in Vienna, Austria, Auer studied ballet at the Vienna State Opera Ballet and then at New York’s School of American Ballet. He went on to a professional dance career with North Carolina Dance Theatre, Eliot Feld Ballet, Frankfurt Ballet and at Pacific Northwest Ballet. With was there that he met wife Patricia Barker, a prima ballerina with the company. They’ve now been together for 33 years. After his career as a dancer, Auer’s second career was as a self-taught computer software engineer. He has worked at Microsoft, Boeing, Carnegie Mellon and others—creating software, developing early virtual reality technology, and doing market research. Much of Auer’s work happens behind the scenes, working with technology, projects, and working with choreographers as a creative conduit for their visions for the music, audio, and special effects. Photo credit Eric Bouwens. That diverse skill set has served him—and GRB—well since Barker took over as artistic director in 2010. The 62-year-old Auer is not only Barker’s right-hand man, artistic advisor, confidant, and sounding board. He also plays the role of website developer, IT guy, and technical liaison between guest choreographers and GRB’s production staff. Instead of assuming the job title of “artistic associate,” standard at most ballet companies, Auer says he bestowed upon himself the title of creative director, a title he was used to at many of the tech companies he worked for in the past. Because, along with the aforementioned duties, he takes on rehearsing and coaching roles for the company’s dancers and teaching class, the position of creative director is more fitting to the broad scope of his responsibilities. 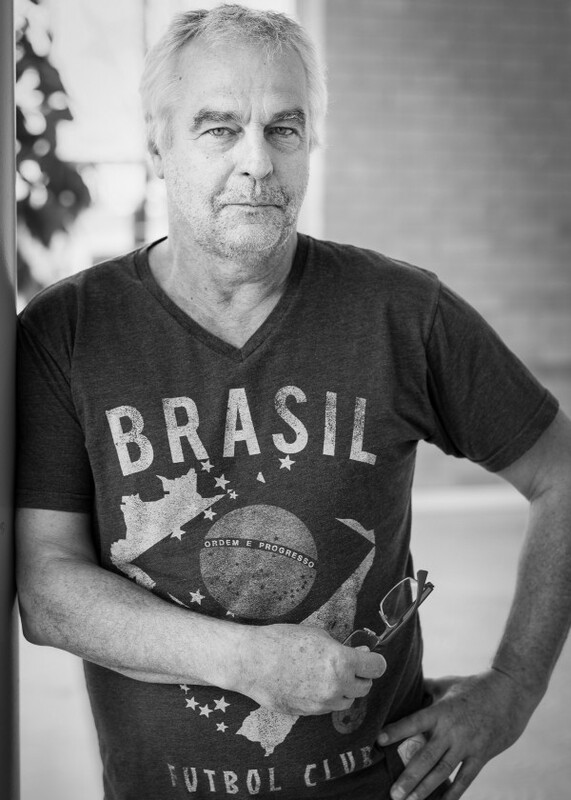 Perhaps his biggest duty is acting as a creative conduit between guest choreographers/répétiteurs and the capabilities of GRB’s 300-seat Peter Martin Wege Theatre. “Primarily what I do when a choreographer comes in is help facilitate things like the use of music and any audio editing that needs done. [I help with] technical requirements, such as if they are looking to do projections and special effects, and how the stage needs to be arranged,” says Auer. His efforts in those areas are perhaps best seen in GRB’s popular contemporary dance series “MOVEMEDIA.” The series takes the creative talents of some of today’s most sought after choreographers and blends them with visual elements and technology to provide a contemporary performance experience. In past “MOVEMEDIA” productions, Auer has helped choreographers with creating video projections and other special effects, including helping to make the background video of a film strip in choreographer Robyn Mineko Williams’ “One Take” (2014) look vintage, and remixing the music and navigating flashlight logistics for GRB resident choreographer Penny Saunders’ 2015 work for the company, “Slight.” He also came up with 3D stage floor projections of water and moonlight for Mario Radacosky’s 2012 ballet “Black & White: Swan Lake” that the company reprised last month. Dancers rehearse for “MOVEMEDIA” performances this weekend. All photos credit Eric Bouwens. Auer says he has a personal agenda to get choreographers to understand that they have an artistic purpose behind their works and that they are not just putting steps together. “My goal with the work was to create an environment that connects the universal realities of love, life and death, creation and destruction, to the beauty and vulnerability of the creative process,” said Saunders. Set to several tracks from Max Richter’s reworked version of Antonio Vivaldi’s “The Four Seasons,” Saunders says she enlisted Auer to help project images of ink and watercolor paintings by artist Alice Klock during her piece. “This work was inspired by the dancers, my collaborators (Vanessa and costume designer Christian Squires), and the present environment in which we live,” says Dekkers. Rounding out what Auer refers to as “probably the biggest ‘MOVEMEDIA’ we’ve ever done” will be award-winning choreographer Robyn Mineko Williams’ latest for the company. There are certainly advantages for a ballet company in having their own theater space, like not having to pay to rent another theater space, having 24/7 access to it for rehearsals, and allowing for experimentation by choreographers and technical staff. But perhaps the theater’s most unique advantage is the way the stage is raked, with an incline from the front edge of the stage to the back. This allows for everyone in the audience to see the stage floor, making the use of floor projections that one might otherwise only see as an audience member in other theaters seated in the balcony. Auer says while the Peter Martin Wege theater has those advantage,s it also has its limitations. One of the biggest is the inability to fully “fly” in and out stage curtains, drops, and scenic elements such as at other venues they use like DeVos Performance Hall where the company performs its annual The Nutcracker production. Other limitations include the lack of an orchestra pit and having only a 10-foot loading dock door that prohibits bringing in large set pieces. In addition to helping choreographers explore the capabilities of what they can technically do with their works, Auer also helps GRB’s dancers explore what they can do with their art. As mentioned, Auer teaches and coaches the dancers but particularly enjoys rehearsing and “cleaning” dance works. When he is not working his magic behind the scenes at GRB, Auer says he likes to cook. “I think [the kitchen] is a wasted room in the house,” Barker confesses. The Seattle transplants bought a house in Heritage Hill that they share with their 23-year-old pet cat Mathilda and are settling into life in Grand Rapids. “There has been a tremendous growth in the city for the better since we arrived with an influx of new people, new buildings, new restaurants and more,” says Auer. But for now, the pair’s attentions are focused on the upcoming “MOVEMEDIA” production. There’s plenty of magic yet to be made Barker, her dancers, and though the audience may not realize it, by man behind the curtain, Michael Auer.